Beauty, so they say, is only skin deep. 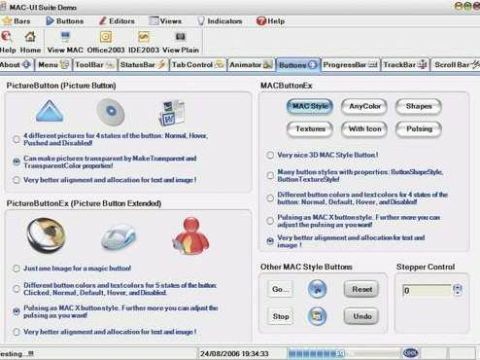 It's certainly true that the Mac's Aqua user interface has been much admired, but on Windows we're stuck with XP's Fisher-Price style themes, at least until Vista finally arrives. Or are we? Mac-UI Suite is exactly what it says on the tin: a Mac-like user interface for .NET applications. It supports both .NET 1.x and 2.x, which means that you can use it with VS.NET 2005 as well as the 2003 development system. Using the system is easy: simply install the product, launch VS.NET, and you'll discover a whole raft of Mac-style user interface controls waiting for you on the IDE's Toolbox window. There are buttons, tab controls, group boxes, toolbars, panels, and more. By default, the controls use the same sky-blue Aqua colour scheme, but this can be changed if desired. All the controls have a UIStyle property which can be used to switch to IDE2003, Office2003 or Plain, in addition to the default MAC setting. So, does MAC-UI Suite 6.01 produce a convincing emulation of a Mac? Well, no. I own several Macs, so I'm familiar with the Aqua interface, which makes me hard to please. Yes, the pushbutton can be made to 'pulse' seductively, and the application window's maximise, minimise and close buttons are replaced by little round green, yellow and red buttons, but somehow the whole thing just doesn't hang together as well.